The first thing Gideon wanted to do this morning is climb onto the cedar chest by my bedroom window and look outside. “Mama? Snow?”, he kept asking me. He has been obsessed with snow ever since our first big snowfall of the season last week. He ran a fever the few days the white fluff stuck around. So Gideon did not get to actually play in the snow until this past weekend when most of it had melted. Gideon’s second fall and winter season will be one of the most exciting for him. He was still to young to understand the potential for fun in seemingly miserable weather, and his little mind wasn’t able to process the hugeness of our white-covered back yard as something he could access, touch, taste, and smell. Gideon is getting better and better at appreciating the details, the little things, that make mundane daily tasks worth learning about and emulating. Not long ago Gideon thought nothing of getting put into his high chair. His attention was not on the little steps it takes to get him there and secure. A week later he is really observing, and spends a few minutes after meals trying to work the waist buckle. His tiny hands grasp the pieces, and work so hard to accomplish that “click” he hears when we snap him in. Gideon thought nothing of where his grapes come from, and now one of his favorite things is pulling his own grapes off of the vine. If I put myself in Gideon’s shoes, as someone who knows so little but wants to learn everything, it actually makes the idea of daily life a little more exciting. He takes so much pride in accomplishing his little goals, and it motivates me to keep things in perspective when I start to feel overwhelmed. This week Gideon is learning that snow melts and disappears. He misses it! I can’t wait for the next snow, just so I can see the excitement in his face. Like he’s seeing an old friend. This Thanksgiving I have so much to be grateful for. After God’s grace and love, I think I am most grateful for being a wife and mother. I want to soak up every day of my life with these two men – one big, one little – and never forget just how blessed I am. I hope this season you can focus on just how thankful you are for your spouse, your significant other, your children, the people in your life that you are blessed to know. I leave you with an excerpt from a blog that I follow. It moved me, and rings true with this mother of a little boy. I hope it strikes a chord with you too. The most beautiful log cabin I have ever stayed in. A Publix cake with fall decorations that says “family” on it. Does anything top it? Two ladies put together gift bags for everyone containing a mug, a prayer journal, Mary Kay hand cream set, a CD with relaxing music, and a beautiful note. What sweetness! and spent a lot of time sitting around the table or fireplace sharing good conversation and laughs. And a ladies’ weekend can’t be a ladies’ weekend without a fair share of relaxation. We were ecstatic to find grandma chilling on the couch when we got back from an afternoon hike. You kick those feet up Grandma! 1. Taking a lo(oo)ng bath in the jet tub. 2. Taking my book to the loft upstairs, and reading peacefully by the window. 3. A hike up the mountain we were on with my mother-in-law and her sister. This was my first weekend away from Gideon. Leaving him behind was the hardest thing I’ve had to do since he was born. It took a lot of self-convincing and self-training to be okay with leaving him. Gideon was in the safest hands, and I knew he was well taken care of. But I still struggled with the idea of us being apart from each other. I had my few minutes of crying when we arrived at the cabin, and then I decided to focus on being grateful for being in such a loving family. My sister-in-law told me that I wouldn’t see the benefit of spending some time apart until I actually tore myself away from Gideon. She was right. I was able to have some time to focus on reading books that inspire me, and do a lot of personal and motivational writing. Gideon had a blast with his cousins, and spent those few days developing his character and personality. By Sunday evening I was rested, restored, and ready to get back to my boys with a little more energy and oomph than before. Gideon’s facial expression and body language reaffirmed how good it is to be apart occasionally. We didn’t want to let go of each other! Did you have trouble enjoying yourself the first time you were away from your little one? What did you do to get past the mommy guilt? One of the things I look forward to most in having a child in our lives is making our own traditions. 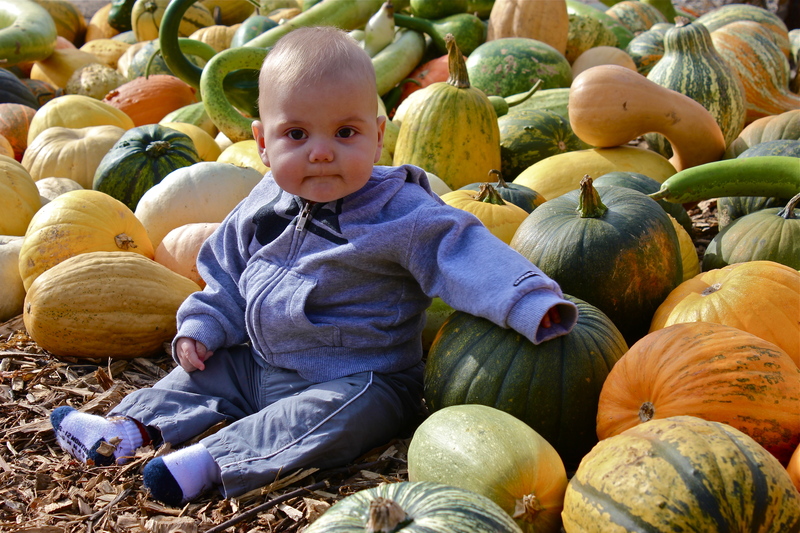 In early November last year, we went to a farm and took some adorable pictures of Gideon amongst the gourds and pumpkins. We visited all the animals, and watched a few planes land in the neighboring airport. It was so fun to observe Gideon in the same setting, a year later. Last year Gideon was not standing yet. This year he was picking up large gourds and carrying them around. He took a special liking to this gourd, and it now sits on our porch. Gideon gives old, vintage tractors a thumbs up. Gideon signing “chickens”. He LOVES chickens. 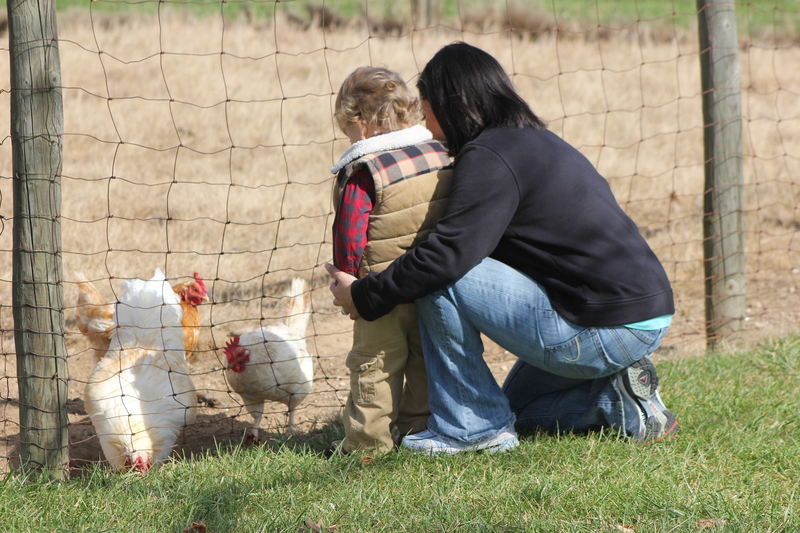 Gideon and the rooster were immediate buddies. Watching a plane land overhead. Halloween night was cold and wet. Immediately after dinner, Gideon got his bath and I put his PJ’s on under his monkey costume. We spent most of the evening at the church building with friends and family. It was so much fun to see Gideon running around with all the other children all dressed up. He enjoyed his raisins and dried fruit, and did not even notice that I tossed the candy in his bucket right back into the church stash. I’m sure next year he will be a little more aware of what he is getting vs. the other kids, and we’ll cross that bridge when we come to it. For now, the less processed sugar the better! Daniel was able to join us for a few minutes at his grandmother’s house to celebrate our little monkey and get some quick pictures. This November has been completely jam packed. I don’t think we’ve had a busier month since Gideon was born. This coming week is a bit of the same. I’m excited about it all, and I’ll be sure to write another update when I get another free hour in the evening next week. Life is busy, life is fun. Here we go! We had some computer problems and lost our September pictures from this year. It has taken me a while to recover, and regain enthusiasm for blogging. In this season of thanksgiving, I am trying to focus on how thankful I am for the pictures that I do have to remember toddler Gideon by. I never take this tree for granted in the fall. It always causes me to pause and admire. Gideon did not like getting his hands dirty after falling on the wet grass. Gideon is dapper in his Sunday getup. Oh ya know, just studying a bug. Gideon is going to be a great daddy someday! I’m obsessed with his curls. Rulos hermosos!! No intention of cutting his hair any time soon. Gideon’s first morning in footie pajamas of the season. Had to document! And here are some snippets from October that I got off my iPod. I have not had time to make some of my fancy videos. The first part is of Gideon pushing a kid size cart through Whole Foods, the second is of Gideon at the playground walking the rocking bridge for the first time, and finally a bit of Gideon enjoying his favorite song of the moment: “Fix My Eyes” by For King and Country. The boy is a little obsessed, and calls the song “oh oh”. Appropriate, I say.